Make the whole world happy. Entertainer sims are the backbone of the entertainment industry, providing both musical accompaniment and in-your-face social commentary. 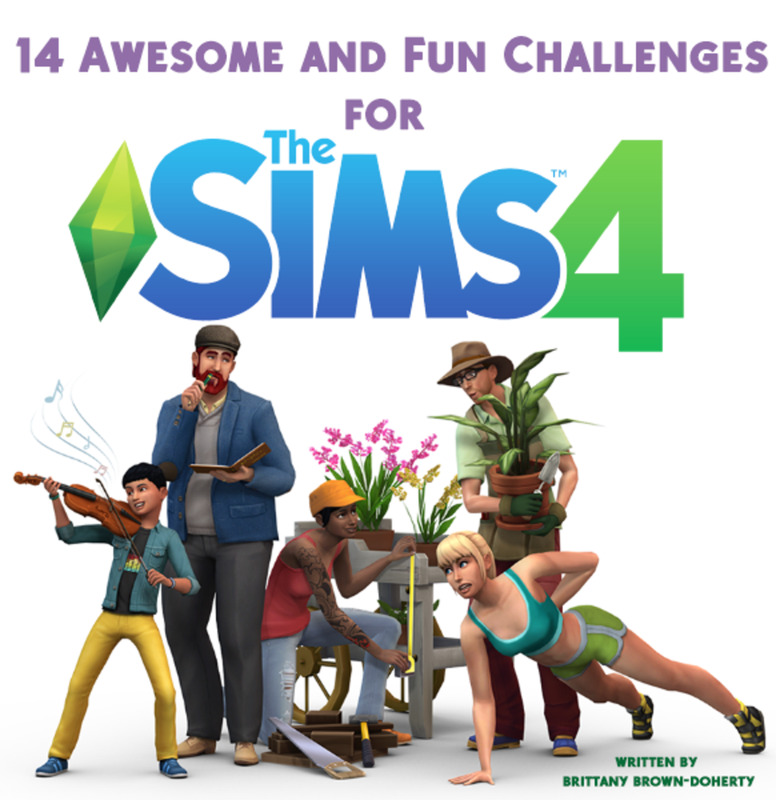 They may be a little under-appreciated by their fans at times, but fame will eventually meet up with the Entertainer sims of The Sims 4 - and money will role in with that fame. Lots of money. Entertainer sims are blessed with some fairly obvious Aspiration choices. If your Entertainer is going to become a Musician, go with Creativity - Musical Genius. If your Entertainer is going to become a Comedian, go with Popularity - Joke Star instead. Simple. Traits are a little less distinct, with Creative and Outgoing recommended for both and Music Lover being a specialist Trait for Musicians. Below is a list of tiers associated with the Entertainer career. 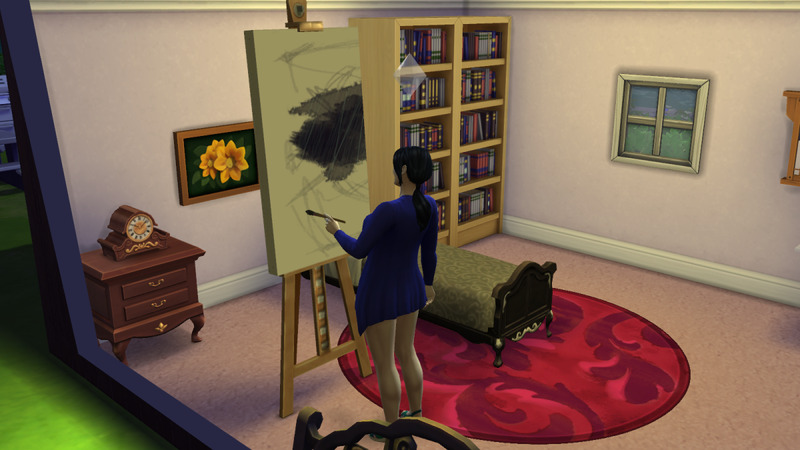 Note that your sim cannot explore both advanced paths available in Entertainer, so there’s honestly not much reason to make your sim proficient in jokes and music. Just sayin’. 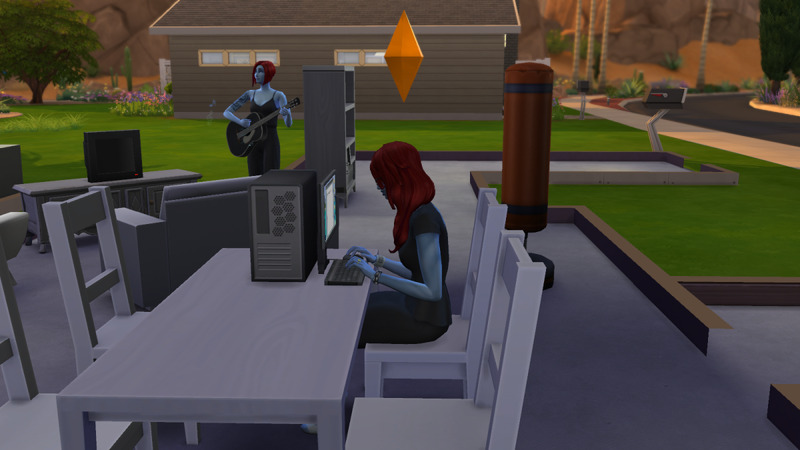 A sim playing guitar for an adoring public in The Sims 4. 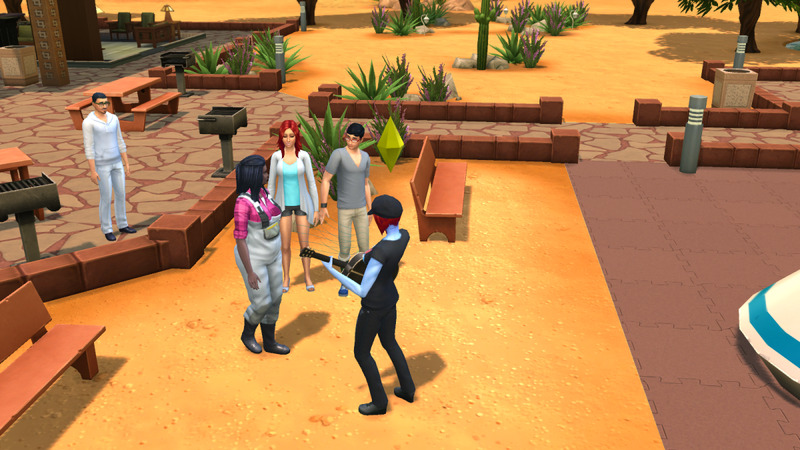 Sims who play instruments to strangers or friends may earn tips. To reach level two, your sim must reach the second level of the Charisma skill. Aside from conversation options, the easiest way to do this is to purchase a mirror and Practice Speech. 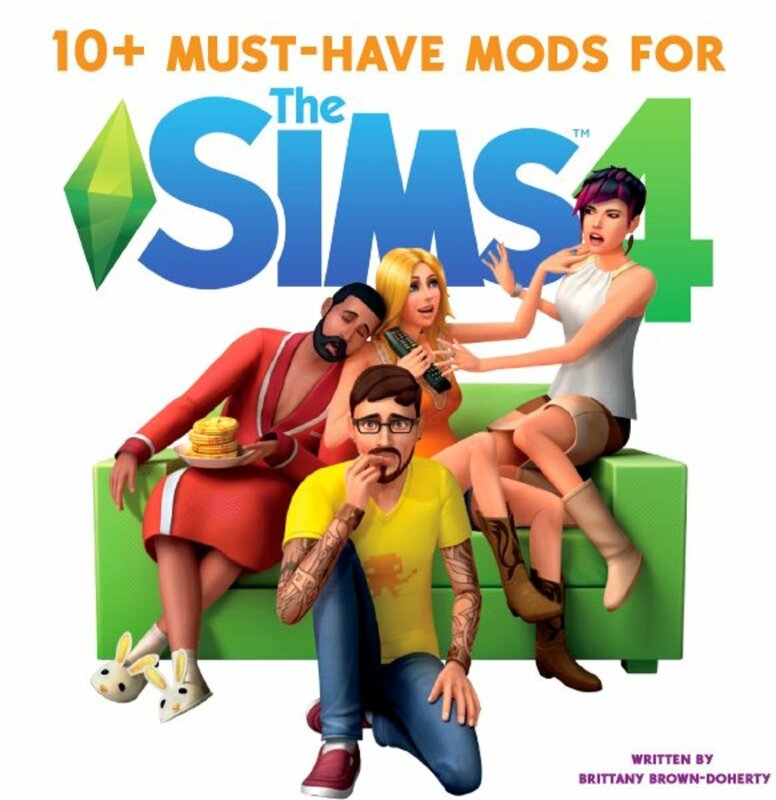 To reach level three your sim must have four friends. Get out and socialize. To jump to level four on Entertainment your sim needs to reach level three on either the Guitar or Comedy skills. 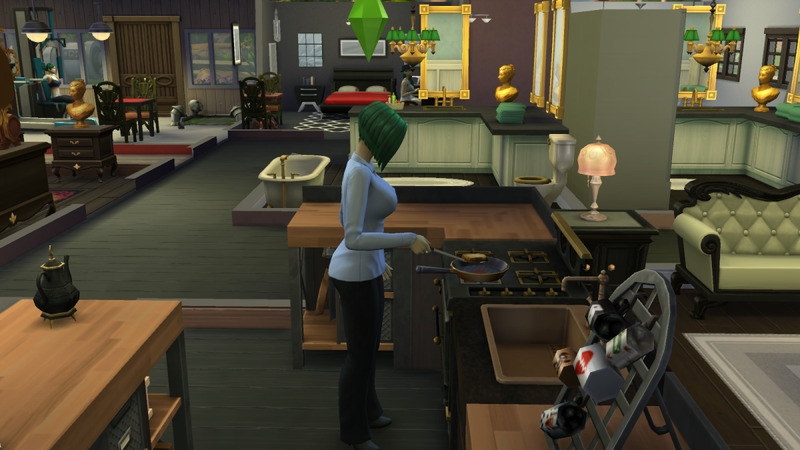 Choose depending on the Entertainment branch your sim eventually intends to pursue. To hit level four of Entertainment your sim must receive a minimum of $100 in tips for performing Comedy Routines or Playing Instruments. 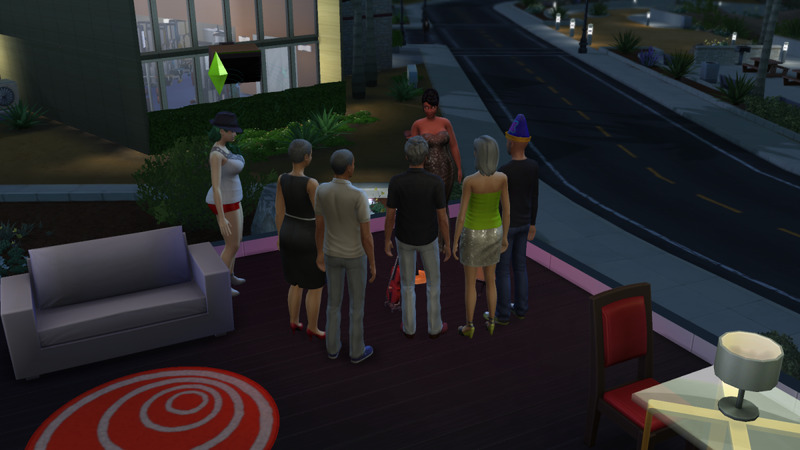 It’s best to send your sim off to a club or park to do this, where they have a ready audience. 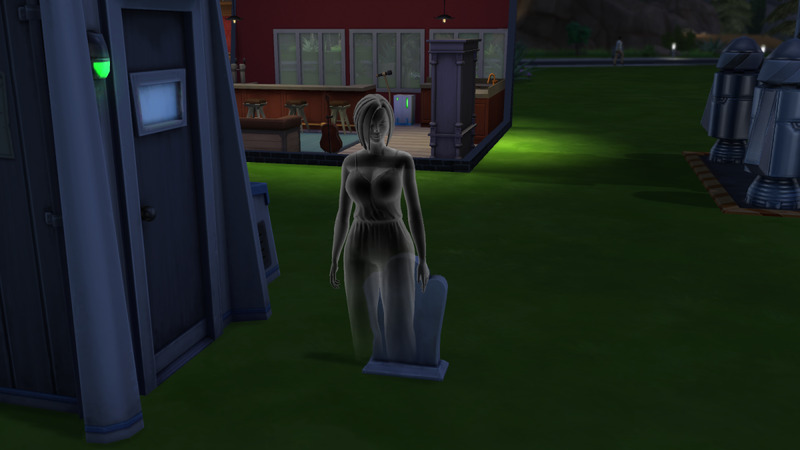 Again, this will probably depend on which branch of comedy your sim is pursuing. After level four your sim’s career branches, and you can choose one of two Entertainment paths. At this point you’ll probably know exactly which branch your sim will prefer. 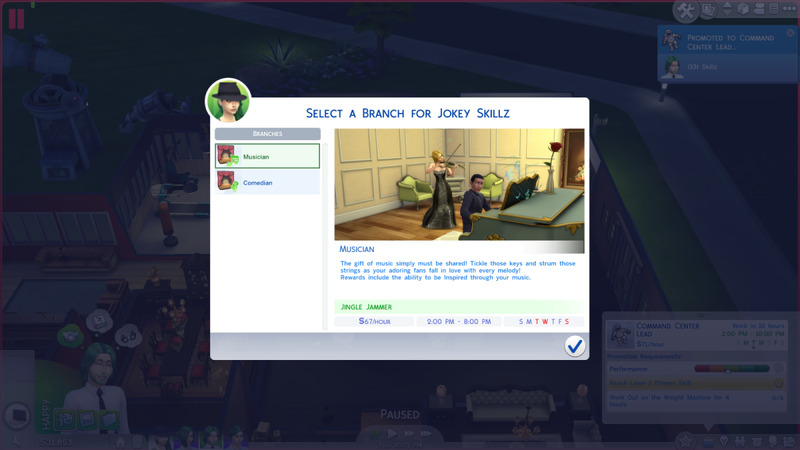 The Musician career branch in The Sims 4. To get to your next Musician level your sim will have to branch out musically and reach level three of Piano and level four of Guitar or Violin. Your sim will also have to write and sell five different Jingles, which you can do by interacting with an instrument, finishing the Jingle, and taking it to the mailbox. Jumping up another level from Serious Musician will require your sim to reach level four on the Piano and level five on either Guitar or Violin. They’ll also need seven friends, which, given the nature of the Entertainer career line, shouldn’t be too difficult. We’re narrowing in. To move away from Professional Pianist your sim needs level five in Piano, as well as to play a piano for ten hours. These two goals go nicely hand-in-hand. The trend continues. To level up this time your sim needs to reach level six in Piano, as well as six in either Guitar or Violin. They must also have ten friends. Sound familiar? Almost at the end of the road. For this final promotion your sim must reach level eight in Piano, level seven in either Guitar or Violin, and Write a Song. You can do this last bit by interacting with an instrument. 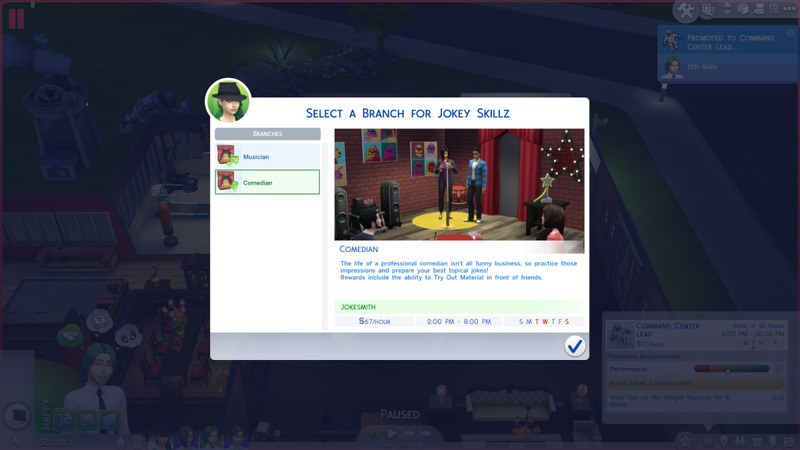 The Comedian career branch in The Sims 4. To reach the next level of Comedian your sim must reach level five on the Comedy skill, Try Out Material on friends three times, and Compose a Routine on a computer. All three are fairly self-explanatory by now, though Try Out Material can be annoying depending on timing. Moving to level seven in Comedian requires your sim to reach level seven in the Comedy skill, as well as earn $1 Performing Comedy Routines. Back to the night clubs and lounges with you. 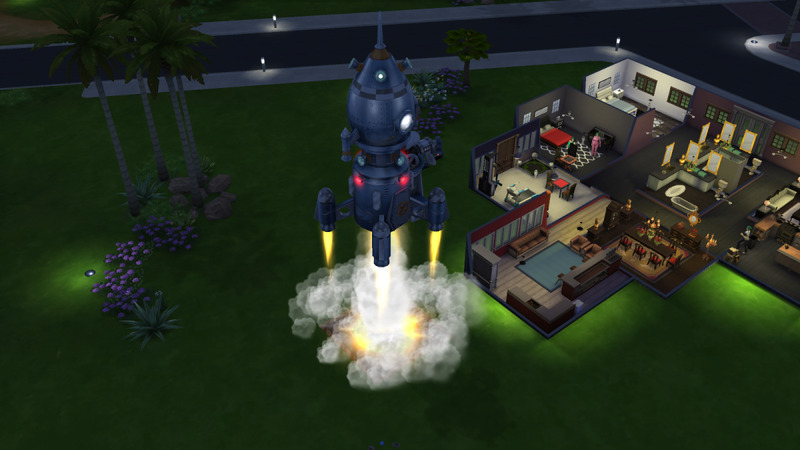 To jump to the next level your sim needs to reach level eight in Comedy and Charisma. They also have to Refine a Comedy Routine. You can Refine Routines on the computer; you will most definitely have one to improve by this point. Getting close to the end of the road. To move to the next level your sim must reach level nine in Comedy and level five in Charisma, as well as Write a Comedy Book. Though this is a Comedy option, you’ll find it with the other Genre Books under the computer’s Write option. To bypass this level and hit the end of the Entertainer branch you must push your sim to level ten in Comedy and level six in Charisma. They must also Perform Long Routine twice, with two different Routines. Best get writing. Quick note: Perform Routine in Space actually earns your sim a decent amount of cash ($400 a pop) and doesn’t take too long. It does, however, have a cool down time, so you can’t farm it over and over.